Licensed social workers and psychologists offer families, couples, and individuals in-depth assessment and short-term, solution-focused therapy designed for the specific needs of each client. 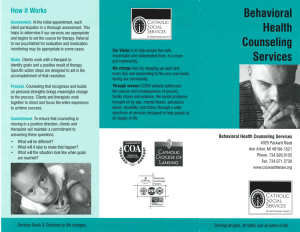 Substance abuse assessment and treatment are also available. When appropriate, the program provides on-site psychiatric evaluation and medication monitoring. Extended evening and weekend hours available. For initial intake or more information, please call 734.926.0155. Fees are assessed on a sliding scale. CSSW is an authorized provider for many insurance and managed care plans. Clients are encouraged to check whether their policy covers mental health services. A prior authorization may be required.